OMG! These biscuits are incredible! They're so "deceptively" easy to make and they come out light, moist, and fluffy. 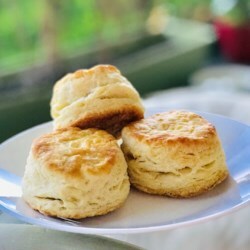 Plus they rise nice and high -what more could you want from a buttermilk biscuit! I baked these on a baking sheet lined with parchment paper and brushed the tops with melted butter during the last five minutes of baking...WOW what a great biscuit!